There are often inquiries, on various forums, as to which NiMH battery charger is the best choice. 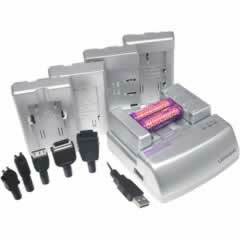 I have prepared a table of popular NiMH chargers that meet certain minimum functionality, and that are reasonably priced. This is a non-profit, non-commercial site; I don't sell anything. These criteria also define what you should look for in a charger. Even if you buy a high-speed, high-current charger, it should be capable of charging the batteries at moderate current when you aren't in a hurry because high-speed, high current charging is very bad for NiMH batteries in terms of how long the batteries will last. There is a marketing advantage in advertising very short charging times, and most users don't understand that such fast charging results in significantly shorter battery life. So far, I have found only eight chargers that meet these criteria. If you know of other chargers that I have missed, please let me know. Green indicates good, red indicates bad, regular text indicates average. Sense ? ? ? ? ? ? ? ? Fan No No No No No No No ? 1. Subtract $2 per 2300-2700mAH AA cell, $1.50 per 2100-2200mAH AA cell, $1 per 2000mAH AA cell, $1 per AA 700-800mA cell, $0.50 per 4 battery holder, $1 per 8 battery holder, $2 per battery tester. All chargers can be powered from the AC mains. However not all chargers come with a world-wide AC power supply that can be used from 120- 240V. You can always buy a 12V universal adapter for the chargers that are not supplied with one. Very few chargers that have the capability to use a car cord have a built-in AC adapter. It's much more convenient to not have to lug around an external AC adapter with the charger. The only model with this feature is the Tenergy T60008 from http://www.all-battery.com. Avoid any charger that doesn't have a DC car cord included, as this feature is very useful, not only in vehicles, but also on airplanes with EmPower or cigarette lighter outlets. 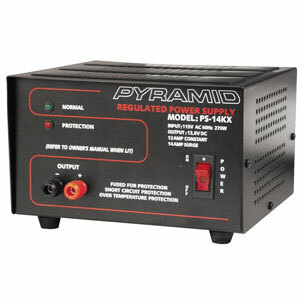 You could use a 12VDC to 120VAC or 240VAC inverter, but this is a hassle to carry around. 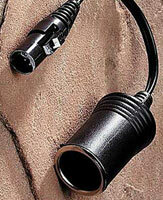 An EmPower to cigarette lighter socket adapter can be found at Magellan's. Radio shack may also carry them (they used to have them, but I didn't see them on their on-line catalog). American Airlines uses regular cigarette lighter adapters, and provides these outlets on some rows in coach. On most airlines, EmPower sockets are only found in business class and first class, and only on larger planes, see http://www.rentcomputers.com/sosair.html. Be sure that your charger can accept the 15V put out by EmPower sockets, but most can. If you want to power several devices at one, bring a cigarette lighter splitter. On one flight I was running my notebook PC, and charging both my cell phone and my PDA, all at the same time. I thought about bringing one of those 12 volt coffee makers on board, but thought that the flight attendant might object. This feature lets you plug the charger into the USB port of a computer, and use the power from the USB port (5V/0.5A minimum) to power the charger. Charge times will be slower due to the limited power available, but you just need to carry a short USB cable, rather than a bulky AC adapter (though in some cases the adapter is built into the charger anyway). The only chargers I could find that have USB input, plus four individual charging circuits, are the Tenergy T60008 from http://www.all-battery.com and the Suncocell SCR-A099. Both are good deals though I have no idea as to the quality of the batteries. The Tenergy T60008 is available unbundled for $22. Another charger that can use USB input is a new charger from Ultralast that I saw at Fry's that comes bundled with Hybrio batteries, but that I haven't yet seen on any web site, and don't know the details (the packaging of the charger had very little information). I added it to the table above, with the model number and UPC. Hopefully it will soon show up on the Ultralast web site. Don't confuse the ability to power the charger from a USB port with the chargers that have a USB output port (power only) to which you can connect a device that can be charged from a USB port. For example, the Lenmar MSC1USB Mach 1 Fusion has a USB output port which can be used simultaneously with the regular charger (which can charge most Li-Ion batteries as well as NiMH AA cells), but cannot be powered from a USB port. you many not be able to tell by looking at the connectors, they may be daisy-chained, sharing power and bandwidth." There are four errors in the above statement which was posted in rec.photo.digital by one of the main posters of incorrect information to that forum. First, every USB socket in a computer is connected to a unique USB port. Second, the USB connectors are not daisy chained, either for power or data. Third, the USB ports in a computer do not share USB bandwidth (each one can operate at the full 480 Mb/s). Fourth, the USB ports in a computer do not share power (each port is capable of supplying a minimum of 500mA). I have a lot of experience with USB design, including on the power side of it, so hopefully I can clear up the confusion, though I doubt that many people are as confused as the person that wrote the statement above. 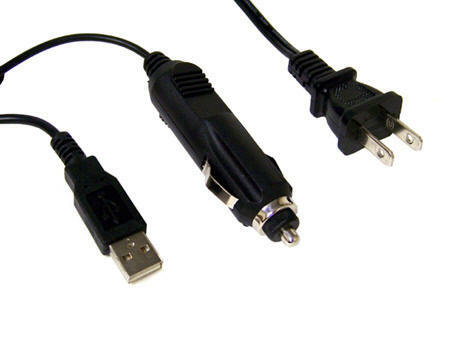 USB uses a multi-level star topology, and every USB socket is connected to a unique USB port on the USB root port hub in the computer. Each USB port on a computer can supply a minimum of 500mA; that 500mA isn't shared among all the ports. Only if you plug in an unpowered USB hub into a powered USB port is the power on the ports from the hub shared among the hub ports. While the USB specification guarantees only 500mA per USB port, this is a minimum, the port doesn't shut down at 501ma! In most cases a USB port will supply 750-1000mA before the over-current protection circuit shuts it down, especially if not all USB ports on the system are used (there are no guarantees, so don't run out and design a device that draws 1000mA). For example, the National Semiconductor LM3544, a widely used over-current protector, limits the current per port to 1.0A (typical) even though the total current limit for four ports is 2.0 amps (to protect the power supply). What this means is that if you don't use all the USB ports, the ones you do use will be able to supply more than 500mA of current. This is why external notebook hard disk drives will usually work without using the external power adapter, or Y adapter (two USB ports power the device), even though they draw more than 500mA. Obviously you shouldn't try to connect four external DVD±R/W drives to one computer, without using the external power supplies for the drives. While you shouldn't design a USB peripheral that exceeds the guaranteed 500mA, the reality is that the limit is often exceeded without any consequences. HID class (human input device) peripherals such as mice and keyboards obviously require very little current (15-25 mA), and powered devices such as printers and scanners require no current, leaving more current available for higher power, USB powered devices. These HID devices can request only 100mA power when they are plugged in and enumerated. Some computers have designated high-power USB ports. 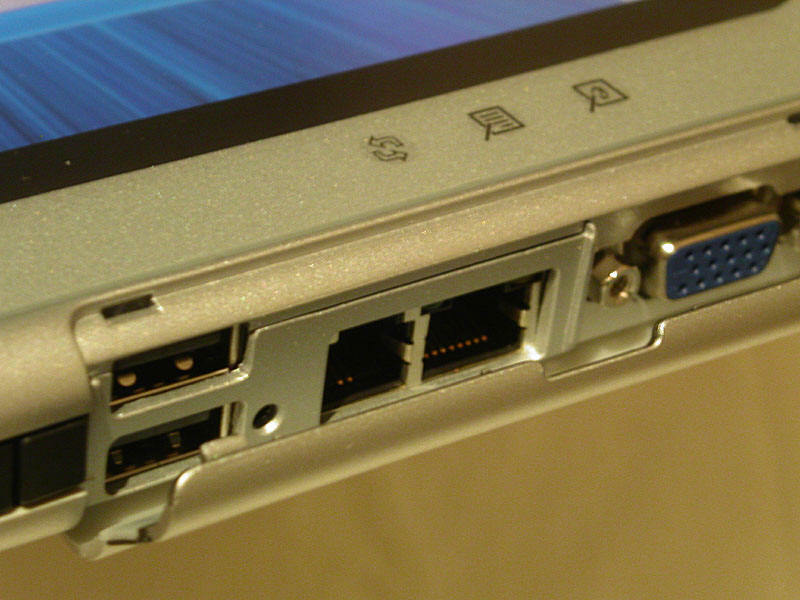 For example, I helped design a Compaq Tablet PC (TC1000/TC1100) with such a port. Next to one of the USB ports is a keying hole. Compaq sells an external CD/DVD drive that plugs into this port, and the connector has a pin that goes into only the USB port with the key. The reason for this design was to allow portable use of the external drive without the need for an external power supply. This USB port guaranteed 1.5A of current (continuous). Any USB device could use this port, but the CD/DVD drive had to be plugged into this port. This saved precious connector space, eliminating the need for a seperate custom connector. Some external drives have a cable that plugs into two USB ports in order to increase the guaranteed available current. On an external DVD±R/W drive (which will typically draw 800-900mA when writing), you may find that you need power from two ports in order to burn discs, but power from only one port to read discs, but it will often work fine from a single port. You can get into trouble is if the combined current from all USB devices exceeds 2.0A (on a computer with four USB ports). For example, if you plug in a 1A USB device into one port, and then try to plug three 500mA devices into the three other ports, you're at 2.5A, which is over the total current limit of 2.0A. Underwriters Laboratories requires that a USB port shut down if more than 5A of current is attempted to be drawn from it. This is similar to the UL requirement that PS/2 keyboard and mouse ports have current limit protection (typically a picofuse soldered onto the motherboard). Remember those devices that used to tap off the PS/2 connector for power? This was a bad idea because if you blew the fuse you destroyed the PS/2 port unless you were willing to replace the soldered-in picofuse. The USB over-current devices automatically reset once the load is removed. On the few PDA type devices that have a USB host port (as opposed to just being a target USB device) you may run into a real 500mA limit. Such devices are few and far between. Toshiba used to have a PDA with a true USB host port, but I don't know of any other such devices. There is an exception to the 500mA requirement, in that battery powered devices may supply only 100mA per port. This exception is taken advantage of in small systems such as PDAs, but never on notebooks and laptops, even when they switch from AC to battery power. Technically a notebook or laptop operating on battery power could reduce the available current from 500mA to 100mA when external power is disconnected, because it could then be legally considered a battery powered hub. In practice this is never done because it would cause any high power USB devices to instantly disconnect if power were removed, even in the event of a power failure. You can easily verify this by plugging a high power USB device into your laptop while it is on battery power. USB Bandwidth is not shared among ports. Every USB port of the root port hub in the computer is capable of the full USB bandwidth (whether the computer can keep up with four or more USB 2.0 ports operating at 480Mb/s is another issue entirely). The only time bandwidth is shared is if a second hub is connected to the root port hub. Some notebook computer docking stations have a powered hub in the dock, which connects to the root port hub in the notebook. In this case the bandwidth is shared. be used as a standard USB port. A lot of bibimbap and soju was consumed during the design phase of this project at LG in Korea. For more information, download the USB specification from http://www.usb.org/developers/docs/usb_20_040907.zip , unzip the files, open usb_20.pdf, and look at section 7.2. Inside the charger is a DC-DC buck converter with an input range of about 4.5 to15 volts. For chargers that charge cells individually, the output of the DC-DC converter is about 1.8 volts, with the current being variable, depending on the input current. For a USB port at 500mA, the total current available is 5V*500mA/1.8V=1389mA. Since the DC to DC converter is not 100% efficient, and since the charger controller circuitry uses a small amount of current, the total current available to charge the batteries is 1000-1200mA so the current per cell is 250-300mA in USB mode (this is where the 250mA charger current on the Tenergy T60008 comes from). To charge four completely discharged 2500 mAH cells would take up to ten hours, but of course you're rarely, if ever, charging cells that are completely discharged. When powered from a 12 volt source, the charger could actually charge at a higher current than specified, but the charger has current limiting built into the DC input circuitry to not draw too much current from a USB port, and the same circuitry limits the current from the 12 volt source. They would have had to have a second DC input jack to differentiate between 5 volts (USB) and 12-14 volts (car), if they wanted to charge at a higher rate from 12-14 volts. What About Li-Ion USB Chargers? An LCD display is a little nicer than various LEDs, but this should not be a deciding factor. Do not get carried away with charge current. If you can accept lower charge currents, and longer charge times, you will extend the useful life of your batteries. The higher rate chargers, i.e. "15 minute, 1/2 hour" or "1 hour" chargers," cause the batteries to get very hot, which shortens their life. For digital cameras, most people use two sets of batteries, charging one set while using the other, hence a four hour charge time for a 2400mAH cell is not an issue. However there's a flip side to the charging current equation, in that higher current charging tends to use more of the available capacity of the cell than low current charging. Buchman writes: "NiMH batteries which use the NDV method or the thermal cut-off control tend to deliver higher capacities than those charged by less aggressive methods. The gain is approximately 6 percent on a good battery. This capacity increase is due to the brief overcharge to which the battery is exposed. The negative aspect is a shorter cycle life. Rather than expecting 350 to 400 service cycles, this pack may be exhausted with 300 cycles." What has complicated the issue of charge rate is the increasing capacity of cells without any increase in their physical size. It is necessary for a high capacity cell (i.e. 2700mAH) to dissipate much more heat during a 0.5C charge cycle than it was for an 1800 mAH cell to dissipate during a 0.5C charge cycle. So while a 0.5C charge rate was desirable on a lower-capacity battery, it can cause excessive heating in a high capacity battery. This is why some fast chargers include cooling fans, they are trying to use forced air cooling to transfer more heat out of the battery. It's very similar to the heat transfer issue that affects semiconductors. As more and more transistors are packed into the same size (or smaller) dies, it becomes increasingly difficult to transfer the heat out of the die. While the Pentium CPU had only a small heat sink, as the power of the CPUs increased, it became necessary to device elaborate heat sinks and to add cooling fans. With NiMH batteries, there's a fine line between too low of a charging current and too high of a charging current. Too low, and it may not detect end-of-charge correctly. Too high, and it may heat the batteries to the point where it reduces their useful life. NiMH batteries are now pretty inexpensive (at least AA cells). So reducing the useful life of your batteries, in order to have faster charge times and higher capacity, may be a trade-off that you are willing to make. The best advice, at least with digital cameras, is to try to avoid AA powered cameras, and stick to Li-Ion powered cameras, but there are a couple of very good digital cameras that use AA batteries. On high current chargers (>1000mA or so), a very useful feature is a selectable charge rate to lower the charge current when high-speed charging is not needed. As explained above, very high charge currents have the downside of significantly shortening a battery's useful life. The Maha MH-C401FS has a manually selectable slow charge mode (300mA charge current per cell). For overnight charging, this is ideal. The Maha MH-C9000 has a wide variety of charge currents available. The Tenergy T60008 doesn't have selectable charge currents per-se, but if used with a USB port as the power source it charges at only 250mA when charging 4 AA cells. This actually can be too low, but since the USB port can only supply a limited amount of current, you have to live with it if you want USB charging. All chargers listed monitor the temperature of the batteries, though as I found out with the Panasonic BQ-830, such temperature sensing may not actually prevent overheating. Some chargers will not only detect over-temperature, but track temperature changes over time as another indicator of when the charge is complete. All chargers listed monitor the voltage of the batteries to determine when charging is complete. NiMH batteries reach a voltage plateau which the microcontroller in the charger identifies in order to know when to stop charging. At least some of the chargers listed monitor the internal resistance of the batteries. This is useful for two reasons. First, it is another indicator of charge condition. Second, it enables the charger to recognize when a non-rechargeable battery is placed into the charger (alkaline batteries have a high internal resistance, while NiMH and NiCad batteries have a very low internal resistance). All chargers listed provide individual charging. This is a very important feature, as it allows each battery to be fully charged. Also, there are many devices that use one or three batteries, and it is a hassle to charge odd numbers of cells on chargers without individual charging circuits. The very low end NiMH chargers usually require charging in pairs, as it is a bit less expensive to manufacture a charger with only two charging circuits, as opposed to four charging circuits. Some chargers can charge NiMH 9V batteries (be careful, as NiMH 9V batteries are rated at 9.6V or 8.4V, not 9V). Only one charger in my list is capable of charging rechargeable alkaline-manganese batteries, the Accupower 2010. Sounds like something for your hair, but it's not. This function does an automatic discharge/recharge, which may increase the capacity of the battery. There is little evidence to support this concept (it is a real concern on Li-Ion batteries, but not on NiMH batteries). In any case, you could always do this manually by discharging the battery in a device such as a flashlight. Still it may be a useful feature for the battery "hobbyist." Most of these chargers are convection cooled. This works fine, unless you happen to get a bad cell with a very low internal resistance. The first BQ-830 charger I had was returned to Costco after it melted while trying to charge a defective Lenmar 2000 mAH AA cell. Even a fan-cooled unit might not have prevented such a thing from happening, but clearly the temperature sensing in the BQ-830 left something to be desired. The very high rate chargers should include a fan. If the charger current for an AA battery is more than 3000mA, do not buy the charger unless it has a fan. Warranties range from 90 days to lifetime. There are many poor quality chargers on the market, and chargers that are not well-designed often fail due to excessive heat. The lifetime warranty on the Maha MH-C401FS may turn out to be a useful feature. It is common for manufacturers and retailers to bundle a bunch of batteries with the charger. I have chosen to limit this page to chargers which, when bundled with a minimum of 4AA cells (minimum of 2200mAH), have a street price of less than $75. I have also calculated an unbundled price on the charger value alone (based on conservative allowance for batteries, holders, and battery tester); maximum of $50 for the charger value alone. The option for a lower charge current is a very good feature of the MH-C401FS. Most times you probably won't need a high speed charge, and the lower current charge lengthens the life of the batteries since they don't get as hot. While Maha chargers are not the lowest priced, the warranty on this specific charger appears to be very good, even though I'm always leery of so-called "lifetime warranties." Battery chargers are one electronic device that may actually fail prematurely, due to the amount of heat generated. The terms of the lifetime warranty are not disclosed on the Maha web site. A flip out AC plug (rather than a bulky wall wart) and the ability to use a USB port as a power source make this charger a good choice for travelers. The only charger with these two features (that also has individual charging circuits). 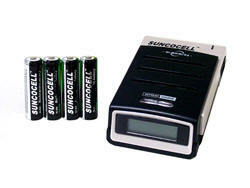 This full featured charger allows the user to condition, rejuvenate, and do capacity tests of batteries. Unlike the MH-C401FS, it does not come with a lifetime warranty. It also does not come with a DC power cord (extra cost option). However it's better than the LaCrosse Technology BC-900 because at least a car cord is available. This charger has one issue. Early models suggested charging at not less than 0.33C, which would be 700mA for 2700mAH AA cells. However there was a problem with the charger detecting end-of-charge at this current level, so Maha changed the recommendation to 0.5C which is 1350mA for 2700mAH AA cells. This higher current will have a slight effect on the longevity of the batteries (it's not stupid-high like 2000 mA, but it's still a tad high). Even Maha states in the manual, "Typically speaking, slower charging rate will yield better battery performance but requires longer time. Faster charging rate may not charge as fully and battery temperature can be higher." One poster to rec.photo.digital poster wrote, "The newly revised Maha C-9000 (says 0G0GB01 on the label - a few months ago) manual has been revised to now say to charge at 0.5 to 1.0 C, in order to detect delta V cutoff more reliably. Actually, I'm not certain it is still delta V, but the early two versions (0FAB01 or 0FAB02) didn't always do all that well on shutoff termination at lower currents. Both the charger and the recommendation were changed for this problem. I believe Maha will replace older versions." Maha has made many changes to this charger since its release, and according to some forums they will replace older models. According to one individual, "...they revised the chargers termination procedure, which is now version 0G0B01 on the rear label (my typo before). Maha has been replacing older units 0FAB01 or 0FAB02. Apparently NiMh cells don't have much of a delta V peak at low currents, which risks overcharging if missed. It can still be set as low as 200 mah, and they left the default charge rate at 1000 mah, unless changed, but the printed recommendation now is 0.5C to 1.0C. Another related change is that it used to charge up to about 20000 mah unless terminated, and now it shuts off after 4000 mah." Note the wide spacing between the batteries. This is because temperature monitoring for each cell is more accurate when the cells are not packed close together. Note: The instructions included with the charger package from Costco are incorrect. This charger does charge cells individually. It is dual rate as well. 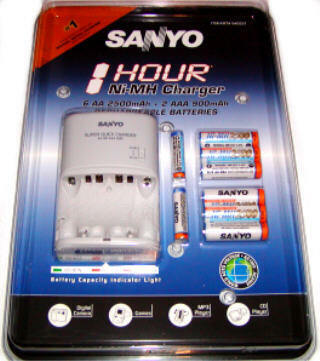 See the actual instructions at http://www.sanyo.com/batteries/pdfs/MQH01_manual.pdf. The charge current for regular rate is 900mA for four AA cells, 900mA or 2000mA for two AA cells (depends on which slots you insert the batteries into). This charger charges batteries individually, but cannot be used with a DC car cord (of course an inverter is always an option, but it's a hassle). It is a very good deal (Costco), at $20 with eight high-quality, high capacity, Sanyo batteries (six 2500 mAH AA cells, and two 900 mAH AAA cells). The batteries alone would cost $18 from Thomas Distributing. It also has a real battery tester, something that is not normally found on chargers. It does work at 100-240V. It is an extremely sophisticated charger, with individual charging control, timer control, peak voltage control, minus delta voltage detection, temperature control/protection, alkaline battery detection, and short circuited cells detection. Unfortunately, Costco no longer carriers this charger. They have a more expensive, and less capable, Duracell labeled charger. This is the situation where a company decided to produce a very capable product, then suddenly realized that they couldn't charge more money for it because most of the target market had absolutely no idea why they should pay a little more, versus the el-cheapo alternative. Sanyo has introduced a charger with Eneloop batteries, as model NC-MQN05, also known as GESMQN054. This model does not have a switch for NiMH versus NiCad charging, which is no big deal. Unfortunately they dropped the internal battery tester which was a really nice feature on the NC-MQH01. This charger has a sliding cover. It is very light and compact. This is a very low rate charger, 300mA for AA, and 150mA for AAA. The manual is available at http://www.eneloopusa.com/pdf/4_Position_Charger_IS.pdf. The manual has incorrect nomenclature, referring to the output current in mAh rather than mA. Still, it might be a good charger for traveling, as long as overnight charging is acceptable. It comes with four AA Sanyo Eneloop batteries. It's $30 at Circuit City or J&R. This wa probably the most full featured compact charger on the market until the release of the Maha MH-C9000. The cheapest place to buy this is at Amazon ($35), since they do not charge for shipping (Thomas Distributing charges $43, plus shipping). 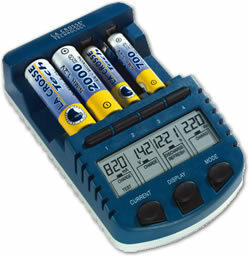 It comes with four AA, and four AAA rechargeable batteries; four C- and four D-size battery adapters; and a carrying bag. Even though this charger uses an AC adapter type supply, there is no DC car cord available. The unit requires 4 amps at 3 volts, which is quite strange, though it is by design. No one that I could find manufactures a DC-DC converter that provided 12 volts at 4 amps. If you are handy with building electronic projects then you can construct your own DC adapter fairly easily, by using a DC-DC converter, a suitable enclosure, and a fused cigarette lighter plug, but it will likely cost you about $30 to build. See http://www.mouser.com/search/ProductDetail.aspx?R=SIL15C-12SADJ-Vvirtualkey54020000virtualkey826-SIL15C-12SADJ-V. You could also simply use a small inverter for in-car use; 75 watts is more than enough. There seem to be many complaints about this charger's reliability on the various forums. If you're going crazy with chargers for cell phones, camcorders, PDAs, GPSes, digital cameras, etc., you may want to consider a universal charger that can charge both AA cells and most Li-Ion batteries. This charger can charge nearly every Li-Ion camcorder or digital camera battery, as well as NiMH AA and AAA cells. It has a USB connector for using USB charging cords for cell phones, PDAs, and other devices that can be charged via USB (simultaneously with charging batteries on the adapter plate). It can be powered by AC, or by an included car cord. This charger will end the excuses regarding Li-Ion batteries! There is also a version without the USB output (MSC1U). Buy from Digitally Unique for $53. It comes with adapter plates for the most common batteries, and you can buy plates for most other Li-Ion batteries. It comes with a coupon for one free adapter plate (or download coupon). The USB output is very useful especially because it works simultaneously with charging a Li-Ion battery (or NiMH batteries) on an adapter plate. 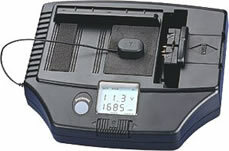 One problem with universal chargers such as the Maha MH-C777PLUS-II (below) is that while it can be used to charge a cell phone battery, the battery must be outside the phone, and it is limited to one battery at a time. If you are having a hard time finding a replacement charger for a less popular brand of camera or camcorder, you will want to look at this charger and the available plates. This charger will also charge virtually any battery, but it requires a little more work on the part of the user when charging proprietary Li-Ion packs, since you need to align moveable pins with the contacts on the pack, as well as figuring out which contacts to connect to. It can charger virtually any Li-Ion pack, including cellular phone packs (removed from the phone). $75 from Thomas Distributing. Buy battery holders for NiMH and NiCad batteries. Buy some additional clip leads to connectorize the battery holders see http://thomas-distributing.com/maha-mh-c777-faq.htm. This is an endlessly discussed issue on the digital camera Usenet groups and other forums. Manufacturers of cameras, camcorders, cell phones, PDAs, notebook computers, high end bicycle lights, etc., moved from NiMH to Lithium-Ion batteries for a number of very good reasons, but there are also some advantages to the older technology, at least when the NiMH batteries were AA or AAA size cells. Please visit http://batterydata.com for more information. To keep large numbers of batteries topped off, without damaging them, you can build a charger that continuously supplies a very low charge current (10mA.or so to the pack) I do this because it enables me to keep fresh batteries, ready to use, available for my kid's toys, FRS radios, etc. It also prevents the batteries from going bad, which will happen if you let them sit around for long periods of time uncharged. You could not really charge a fully discharged battery with this charger (it would take hundreds of hours), but it's fine for keeping quantities of batteries ready to use, without damaging them. The cost of such a charger is very low, it's just some diodes, resistors, battery holders, and a cheap regulated AC adapter that can put out around 7.5V. For four batteries, you need to supply a minimum of 6.6V (1.65 x 4) to each pack. Since the packs need to be isolated from each other (you cannot charge NiMH batteries in parallel), a diode is used on each pack, which also drops the voltage down by 0.7V. So you should use a 7.5V, regulated, AC adapter. 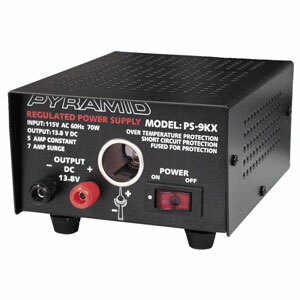 The voltage doesn't have to be precise, but it should be somewhere between 6.5 and 7.5V. Using this charger, I measured the current flow through a set of four fully charged Sanyo 1800mAH AA cells (1.43V per cell, no load), and it was about 10mA. Measuring the voltage of the four-pack, when not hooked to the charger it was 5.72V, when hooked to the charger it was 5.73V. The no-load voltage at the battery holder terminals was when open circuited it was 7.4V. Attach a connector to each pack. The connector I specify is convenient because it is two molded connectors on a cable, you simply cut the cable apart, and splice each end to either the battery pack. Install a diode between the +7.5 and the positive lead of the mating connector. This isolates each pack. Install a resistor between the -7.5 and the negative lead of the mating connector. This limits the current to around 60mA per pack, but the actual current is much less because of the pack's internal resistance, and because the voltage of the pack is not zero. The advantage of using a connector on each pack is that you could then plug each battery pack into a regular charger such as the Maha MH-C777 PLUS and be able to fast charge a whole pack, then move the pack to the trickle charger. You could also make a little harness for the Maha MH-C777 PLUS that put three 4-packs in series, since the Maha MH-C777 PLUS can charge twelve cells at once. Buy a PST-1200MF AC adapter ($7 at Fry's) or a PS-10 from All Electronics ($13). Set the output to 7.5V. E-mail me with suggestions for additions or corrections at batteryacademician@nordicgroup.youess (replace "youess" with "us"). If you have an addition, please be sure that it meets the criteria for inclusion stated above. Steven M. Scharf is one of Earth's leading experts on Li-Ion and NiMH batteries, and chargers. An electrical engineer by trade, he enjoys cycling and designing bicycle lighting systems. He lives in Silicon Valley and works for a small semiconductor company See a list of his web sites at http://www.nordicgroup.us/hosted.htm.